One of the most common behavioral problems that people seek help for is dog aggression. Aggression can range from growling to snapping at you to a full-blown attack on you, a family member, a stranger, or another animal. Most aggression, however, is based on fear or anxiety. Dogs will usually give warnings first, though it may be only a second or two before they bite. The challenge for people is to read the signals correctly. If you don’t recognize the early warning signals, the warnings will often increase. Eventually, though, if you keep ignoring the signs, the dog will bite. If your dog is being aggressive, the first thing to do is have him examined by your veterinarian. Your veterinarian may want to run some blood tests as well. Some dogs growl and snap if they are in pain or have a low thyroid problem. The next step is determining why your dog is aggressive and what triggers it. Think about the situation. What happened just before? Where was your dog? Whom was he growling or snapping at? What else was going on around him? The answers to these questions will help you understand the type of aggression. That will give you a better opportunity to improve the situation. Growling, lunging, and biting can occur because your dog wants to protect his territory. Territorial dogs tend to bark and charge at people or other animals approaching their area. This can occur when the dog is in your yard or when people come into your house. Blocking your dog’s view of others may help. You can also train him to go into a crate or another room when visitors come. 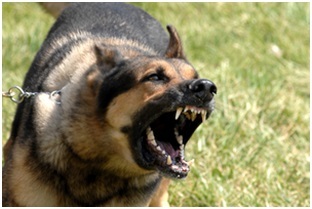 Fear aggression can occur when a dog feels threatened and is afraid of something. He becomes aggressive if he can’t get away. He will defend himself, though he prefers to leave. These dogs will usually attack only if they feel cornered and feel they have no recourse. They will look like they are afraid, sometimes being vocal but backing away from the trigger or holding their tail between their legs. Dogs are often nervous or afraid when they lick their lips or yawn. Never let children hug or kiss dogs. Many dogs don’t like this and are threatened by it. This is a common reason children are bitten by the family dog. Backing away and giving your dog space is the best solution. This is similar to fear aggression because they are both based on fear and feeling threatened. The dog that becomes defensive, however, believes the best defense is a good offense. These dogs may charge you barking and growling. They are telling you to get away. If you back away, they will often stop, as that is what they want. However, if you freeze or move forward, you are more likely to be bitten. Possessive aggression happens when a dog is guarding something that is important to him. This could be food, toys, or sleeping areas. It is best to train your dog to accept you and others in your home handling his possessions. If your dog growls when you try to move him off a bed or sofa, don’t allow him on the furniture. This aggression comes from dogs that want to be the top dog in their pack. They may display this only with certain people. Anything that your dog doesn’t like or makes him feel you are controlling him can trigger dominance aggression. However, this is actually an uncommon reason for aggression. Consult with an animal behavior specialist for the proper way to train your dog if you believe dominance is the problem. An aggressive puppy is often afraid and will react aggressively in keeping with the descriptions of fearful or defensive aggression. 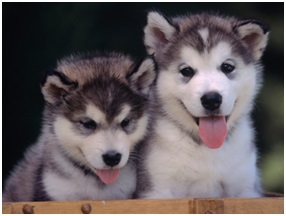 These puppies are most likely to nip when they feel cornered or intimidated and can't get away. Possessiveness can trigger aggression in puppies who may have had to fight for resources like shelter or food if they were strays or from a crowded breeding or shelter environment. Dominance and territorial aggression are rare in young puppies, who are still figuring out where they fall in the heirarchy of your household. Puppies may growl during play, and this is generally not a concern. However, you want to try to control any nipping. Discourage biting your hands or clothing during playtime. Use a spray bottle if your puppy is nipping other dogs too much during play if the other dog isn't nipping or giving warning shots back. Dogs reach what is known as "social maturity" between one and three years of age. This is the time that you may first notice problems with your dog as he becomes more confident and sure of himself. These are the most common reasons for aggression. Dogs that are aggressive toward children are more of a concern. Even small dogs can seriously injure people. It is best to work with an animal behavior specialist when dealing with aggression problems to ensure that you train your dog correctly. Remember, you must never let down your guard, especially if your dog has actually tried to bite someone.